0800: I’m waiting for the final of the women’s 200-metre race to begin. I’m watching it on free-to-air tv. I have a mug of earl grey tea and an empty breakfast bowl. I’m liking the look of Shelly-Ann Fraser-Pryce and wishing that I had her hair. 0801: They seem to be running faster than I could. This will not be a surprise to many. 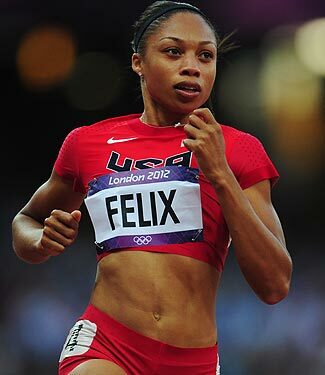 0801: Allyson Felix has won. Her hair is definitely not as cool. 0802: Not sure the live blog format quite works for these events. 0810: I’m still thinking about Shelly-Ann Fraser-Pryce’s hair. Time for a shower and to get ready for work. When the (running) stars make you drool just like a pasta fasul, that’s amore! I was glued to the screen all through your blog. Exciting stuff! I’m disappointed that this live blog runs the wrong way – a REAL live blog has its most recent update at the top, not the bottom. Thanks C. I’ll try and get it ‘right’ for next time. When’s the marathon? In the meantime, you could always turn your monitor upside down, or stand on your head.